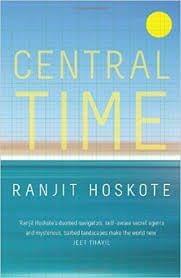 In Central Time, Ranjit Hoskote becomes the storyteller of a turbulent epoch. We meet Ovid and Ghalib, poets in exile or eclipse, in these poems, which are by turns elliptical, conversational and narrative. We meet painters who betray their art, and sculptors who are betrayed by theirs. Fascinated by the enigmas of time, memory and evanescence that art invokes, Hoskote addresses a range of artists including Bihzad, Magritte, Masaki Fujihata and Ranbir Kaleka. At the same time, he retains his affection for the natural world, celebrating the textures and intensities of sensuous experience: the roughness of stone, the dance of light, the flowering of touch and the taste of salt and cinnamon. A testament to a present shimmering like a mirage between contested pasts and vexed futures, this book pivots around moments of encounter: a defiant squirrel in Anuradhapura, an enigmatic collection of objects in a Berlin museum or a man discovering a mass grave near Kabul. Written between 2006 and 2014, the hundred poems that form Central Time resonate with the crises of war, genocide, terror, forced migration and the precariousness of belonging.